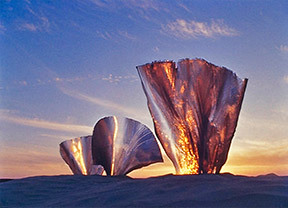 Heinz Mack has a strong artistic interest in exploring pure light in areas of unspoiled nature, especially in the vastness of the African and Arabian desert, and in the perpetual ice of the arctic. 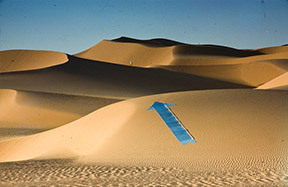 In 1959 Mack drafted the so called “Sahara-Project”, which he started realizing in the African desert from 1962/63 on. 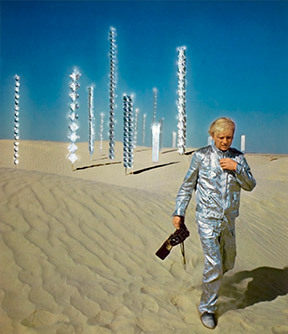 Several times, he installed an “artificial garden” in the desert, consisting of sand- and wing-reliefs, cubes, mirrors, sails, banners and monumental light-stelae. This experimental practice with the force of light is shown in the highly respected and awarded film “Tele-Mack”, which was made in 1968. In 1976, Mack realized his utopian projects in the arctic for the first time. 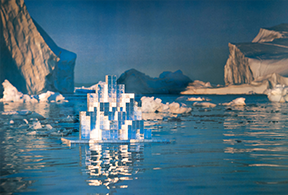 There, he installed swimming plexiglas-bodies, light-flowers, prismatic pyramids, ice crystals and fire-rafts. The travels into the arctic and deserts are documented in the book “Expedition Into Artificial Gardens“, which Mack issued together with the photographer Thomas Höpker.